It’s a new year and a new start. Always an exciting time with resolutions, ideas and enthusiasm abounding. 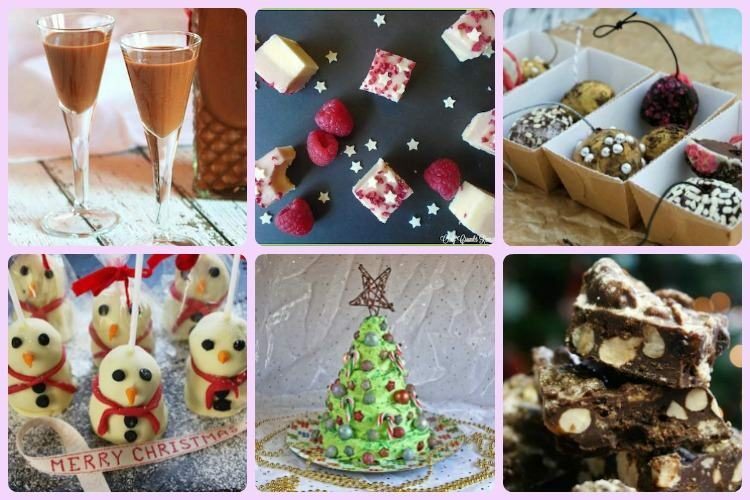 New diet plans may be in the offing, but we are still in festive season, so I have no qualms in offering up these 14 celebratory chocolate recipes from chocolate loving food bloggers. If you scroll down to the bottom of the post you’ll also find the January link up for this month’s We Should Cocoa. Please do join in. I wish you all a very Happy New Year. Chocolate cups make such a good container for all sorts of goodies. Kat at Baking Explorer went one better with these syllabub star cups. Fudge makes a perfect gift for the sweet toothed among us. I’m itching to try this raspberry & white chocolate fudge from Angela at Only Crumbs Remain. If you like your chocolate in liquid form you’ll likely want to try some of this vegan nutella cream liqueur from Nico at Yumsome. I also went gluten free with my festive We Should Cocoa bake last month. These chocolate pistachio biscotti with orange and cardamom were delicious. No festive occasion is complete without some sort of meringue. This prodigious pav from Jenny at Apply to Face Blog is a fuss free regular at her dining room table. Slabs of chocolatey goodness packed with fruit and nuts is another festive must have. Dom over at Belleau Kitchen even found some vegetarian friendly marshmallows to go into his Christmas gluten-free rocky road which makes them even more appealing. Who doesn’t love pizza? Johanna at Green Gourmet Giraffe came up with this fab chocolate and blackberry pizza made with cream cheese and maple syrup. it sounds quite exotic, but how I want a slice. If you have any tins of chestnut puree lurking in your cupboards, you could follow Cakeyboi’s example and make these chocolate and chestnut cupcakes. Suelle from Mainly Baking also baked with a combination of chocolate and chestnut – chestnut flour brownies. Just look at this splendid layered chocolate-mint Christmas tree from Gluten Free Alchemist. It’s gluten free, of course. When it comes to festive gifts, what could be more adorable than one of these snowman brownie pops from Sarah at Tales from the Kitchen Shed? And finally for something to hang from the tree, we have chocolate truffle Christmas baubles from Lucy at Baking Queen. Lovely round up! In spite of having eaten more chocolate than in most of the rest of the year over the last month I’m still getting hungry looking at all the recipes – I do like the idea of those chocolate baubles! Thank you Shaheen. I can’t say that I’ve been at all good, but I’ve enjoyed every minute of it 😉 I hope you’ve had a good break and I wish you both a Happy New Year too. CT says Blwyddyn Newydd Dda. Brilliant roundup Choclette! I love the look of the mulled wine brownies and the chestnut flour ones. Am feeling a bit stuffed right now but am sure I will be using chocolate in a recipe very soon! Yes, it’s definitely getting to the point I’ve had enough. We went out to a tea shop today and I greedily ordered a brownie. I then just wished I hadn’t. What a marvellous array of chocolatey treats – I want one of each. I love the sound of the mulled wine brownies and I just love the look of the pav because my mum can’t plan a family meal without one! And Kate’s layered chocolate mint christmas tree cake is just stunning! Look forward to lots more chocolate in 2017! Thanks Johanna and thanks for being such a great contributor. Yes, I always wish there was some way of being able to have a bit out of each entry – now wouldn’t that be something? Lovely round up. Never enough chocolate recipes published in my book. I do love the look of those brownies. Thanks for showing as mine always seem to be dry and they look lush. I’m rather sadly addicted to brownies and have more recipes for them on my blog than anything else. I’m always convinced that my latest recipe is the best ever! Suelle’s chestnut flour ones will have to be tried. Amazing round up Choclette! I can’t believe how much I have eaten over the last couple of weeks, yet I could happily munch my way through most of these. Great to see a good few gluten free offerings in the list! What a brilliant selection! I love the idea of creamy chocolatey nutella liqueur, it must have taste like a dream, oh and the fudge! I am in absolute heaven looking through this. Love that Christmas tree, amazing! Yes, that Christmas tree is something else. Truly amazing. Thank Angela. I always enjoy seeing what people bring to We Should Cocoa. The snowmen are really clever. What a wonderful selection of desserts. They all look so delicious.